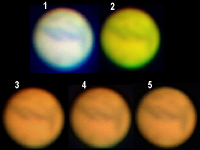 The best images of the planets captured by members of OASI are shown below. David Murton, 04 June 2017. 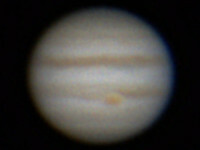 200 mm Meade SCT with Altair GPCAMv2 IMX224 camera. 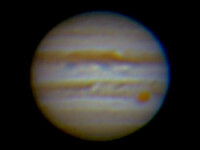 Image taken at 10:02 UT. David Murton, 28 November 2015. Tomline refractor with Altair GPCAMv2 IMX224 camera. 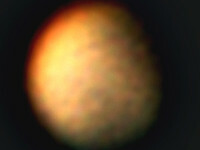 Image taken at approx 19:30 UT, with the planet at an altitude of only 13°. David Murton, 18 June 2017. 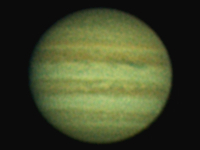 200 mm Meade SCT with Altair GPCAMv2 IMX224 camera and 2x Barlow lens. 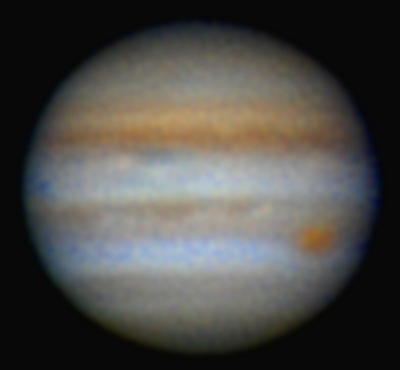 Image taken at 08:22 UT. David Murton, 04 June 2017. 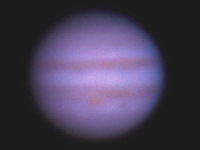 200 mm Meade SCT with Altair GPCAMv2 IMX224 camera. 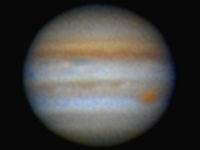 Image taken at 09:46 UT. David Murton, 20 May 2017. 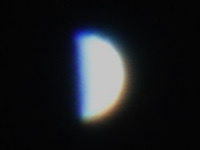 Venus close to dichotomy. Taken just before 07:00 UT. 200 mm Meade SCT with Altair GPCAMv2 IMX224 camera and 2x Barlow lens. David Murton, 03 April 2017. 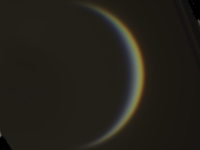 A thin crescent Venus only a few days after inferior conjunction (25 March). Taken at 14:00 UT. Skywatcher 190 mm Maksutov-Newtonian on NEQ6 mount. Altair GPCAMv2 IMX224 camera with 4x Powermate. Nigel Evans, 25 March 2017. 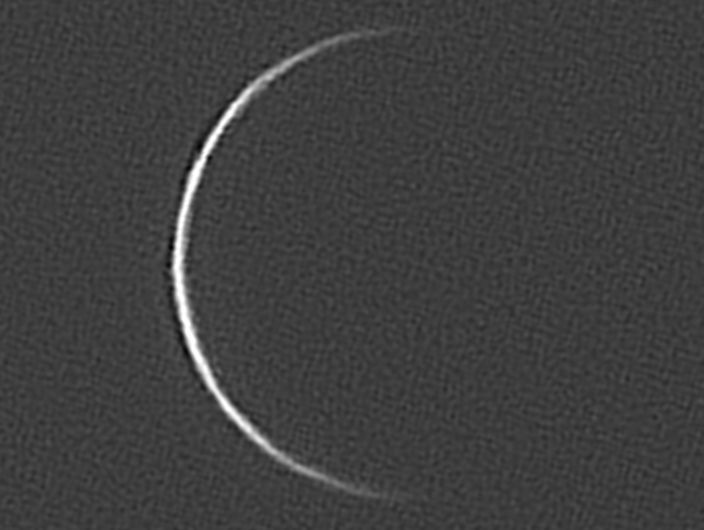 Venus at inferior conjunction. Angular separation from the Sun: 8° 17'. 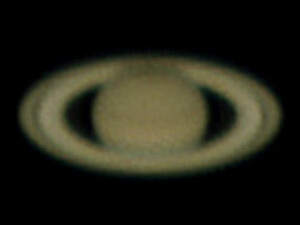 DMK 21AU04.AS camera on 200 mm Celestron Edge HD. Andy Gibbs, 09 March 2017. Meade 200 mm LX200 with 2.5x Barlow lens and QHY5L-II camera. Image taken at 17:17 UT. 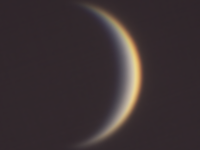 Venus is now moving rapidly towards inferior conjunction on 25 March 2017. 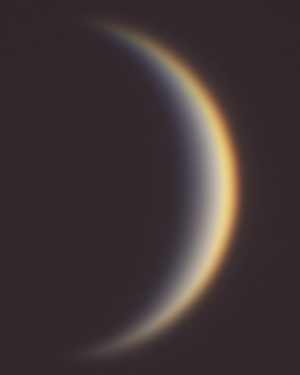 It was shining at mag -4.5 as a 9% illuminated waning crescent with a diameter of 53.2". Andy Gibbs, 02 March 2017. Meade 200 mm LX200 with 2.5x Barlow lens and QHY5L-II camera. 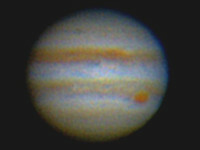 Image taken at 17:21 UT. 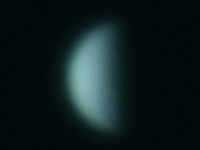 Venus, at 52 million km from Earth, 31° eastern elongation, was shining at magnitude -4.6 at altitude of 13° with an apparent diameter 48". It reaches inferior conjunction on 25 March 2017. Andy Gibbs, 17 January 2017. Meade 200 mm LX200 with 2.5x Barlow lens and QHY5L-II camera. 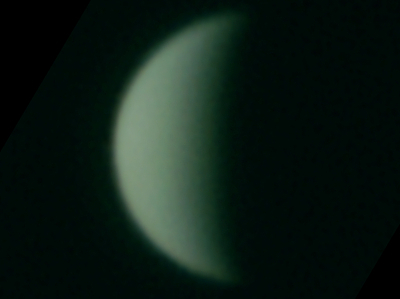 The left image is taken in natural light, the middle with a green (Wratten 58) filter and the right with a blue (Wratten 80) filter. 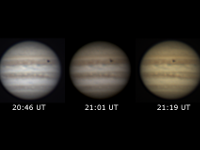 Images captured from 16:48 UT onwards. 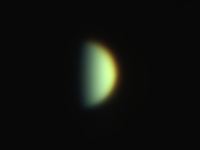 Venus, at 47° eastern elongation, is shining at magnitude -4.5 at altitude 27° with an apparent diameter 25.8". Mike O'Mahony, 17 January 2017. 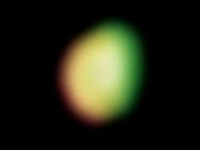 Meade 235 mm SCT with Canon 60Da camera. David Murton, 14 January 2017. Skywatcher 200PDS 200 mm f/5 Newtonian on NEQ6 mount with 4x Powermate. Altair GPCAMv2 IMX224 camera. David Murton, 14 January 2017. 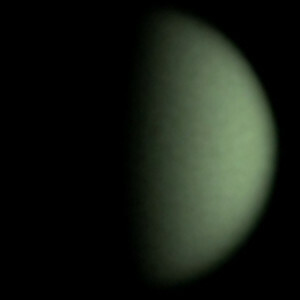 Venus and λ Aquarii. Skywatcher 200PDS 200 mm f/5 Newtonian on NEQ6 mount. Altair GPCAMv2 IMX224 camera. David Murton, 28 December 2016. Skywatcher 200PDS 200 mm f/5 Newtonian on NEQ6 mount with 4x Powermate. Altair GPCAMv2 IMX224 camera. Best 200 frames stacked from 2000. David Murton, 28 November 2015. Skywatcher 200PDS 200 mm f/5 Newtonian on NEQ6 mount with QHY5L-II camera. David Murton, 29 June 2015. William Optics ZS71 ED 71 mm, f/5.9 refractor on NEQ6 mount. Canon 1100D camera. 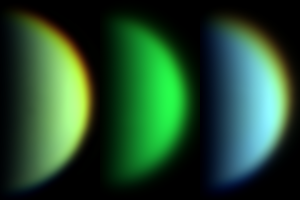 The image was taken on the evening of a close appulse of Jupiter and Venus when the planets appeared shortly before sunset only approximately 0.3° apart. Andy Gibbs, 15 April 2012. 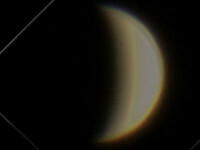 Meade 200 mm LX200 and Atik Titan camera. The planet appeared as an evening object showing a waning crescent phase 29.9" in polar diameter shining at magnitude -4.36. 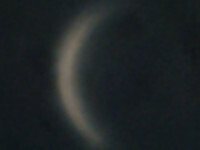 It was en route to inferior conjunction and transiting the Sun on 06 June 2012. Andy Gibbs, 25 August 2018. Meade 200 mm LX200 with 2.5x Barlow lens, ZWO atmospheric dispersion corrector and QHY5L-II camera. The planet was shining at magnitude -2.3 and presented a disc of diameter 21.9". Its altitude was only 11°, which meant that it kept disappearing behind trees and buildings, and there was also some troublesome cloud. The global dust storm seems to be clearing. Mike O'Mahony, 01 August 2018. 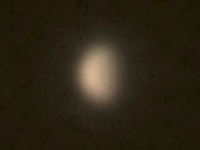 Meade 235 mm SCT at f/25 using 2.5x Powermate. Canon 60Da using movie mode, 1/200 s at ISO 200. 1000 frames stacked. The disk shows little detail due to a planetary dust storm but there is a hint of the south polar cap at the bottom of the image. 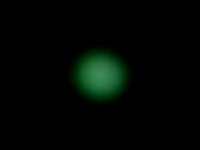 Taken at 23:44 UT with the planet at an altitude of only 12°. David Murton, 09 June 2016. Skywatcher 200PDS 200 mm f/5 Newtonian on NEQ6 mount with 4x Powermate. Altair GPCAM v2 IMX224 camera. 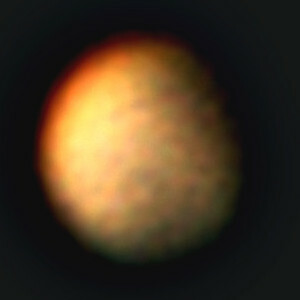 Image taken with the planet at low altitude. Andy Gibbs, 05 June 2016. Meade 200 mm LX200 with 2.5x Barlow lens and QHY5L-II camera. Firecapture v2.3, Registax 6 and Photoshop Elements 11. The planet was shining at magnitude -1.9 and presented a disc of diameter 18.5". David Murton, 04 June 2016. William Optics ZS71 ED 71 mm, f/5.9 refractor on NEQ6 mount with 4x Powermate. Altair GPCAM v2 IMX224 camera. David Murton, 27 May 2016. Skywatcher 200PDS 200 mm f/5 Newtonian on NEQ6 mount with 4x Powermate. Altair GPCAM v2 IMX224 camera. Image taken at 23:55:59 UT, with the planet in the atmospheric murk near the horizon. Mike O'Mahony, 06 May 2016. 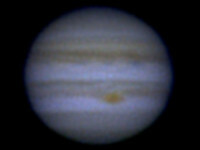 Meade 235 mm SCT at f/25 using 2.5x Powermate. Canon 60Da using movie mode, 50 FPS, 1/100 s at ISO 800. 600 frames stacked in Lynkeos (Mac). There is a hint of the north polar cap at the top of the frame. 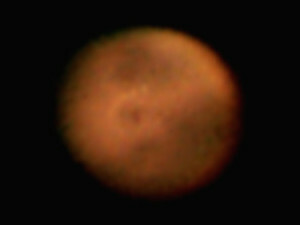 Image taken at midnight on the night of 05-06 May with poor seeing. 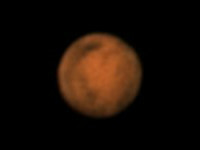 The image is worse than one obtained approximately two years earlier, with Mars at similar distance and altitude (see below, 13 April 2014). David Murton, 01 May 2016. Skywatcher 200PDS 200 mm f/5 Newtonian on NEQ6 mount with 4x Powermate. Altair GPCAM v2 IMX224 camera. Image taken in the early hours of the morning. David Murton, 23 March 2016. Skywatcher 200PDS 200 mm f/5 Newtonian on NEQ6 mount with 4x Powermate. Altair GPCAM. SharpCap 2.7 and Deep Sky Stacker. Best 68 frames stacked from 400. Mike O'Mahony, 13 April 2014. 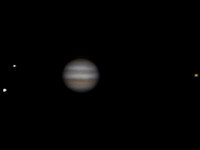 300 mm f/5 Dobsonian with 5x Powermate. 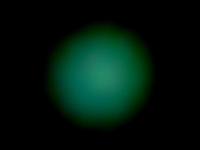 One hundred 0.01 s exposures at ISO 800 recorded with a Canon EOS 600D then stacked using Lynkeos (on a Mac). 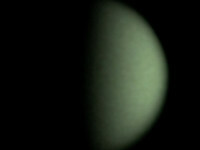 There was an almost full Moon close to Mars and the planet was at an altitude of only 21°, so conditions were not ideal! Andy Gibbs, 13 April 2014. Meade 200 mm LX200 with 2.5x Barlow lens and QHY5L-II camera at approximately 36 FPS. Processed with Autostakkert, Registax 6 and Photoshop Elements 11. Best 350 frames stacked from 1000. Andy Gibbs, 13 March 2014. Meade 200 mm LX200 with 2.5x Barlow lens and QHY5L-II camera at approximately 36 FPS. 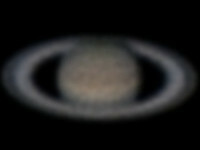 Processed with Autostakkert, Registax 6 and Photoshop Elements 11. Andy Gibbs, 03 March 2012. Mars at opposition. 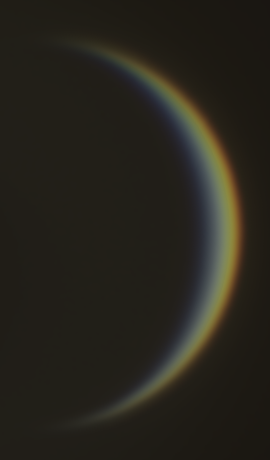 A polar cap and other details are visible. Paul Whiting, 19 October 2005. CCD camera at the eyepiece of the Tomline Refractor. 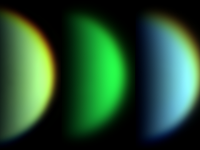 The five variants of the image demonstrate the results of different filters and processing as follows: (1) digital filter, (2) green filter, (3-5) natural colour, each image processed slightly differently to make visible different surface features. Andy Gibbs, 06 May 2018. A test of OASI's newly-acquired Atmospheric Dispersion Corrector (ADC) manufactured by the ZWO Company. The LH image was taken at 22:29 UT without the ADC; the RH image at 22:33 UT with the ADC. The advantage is clear! 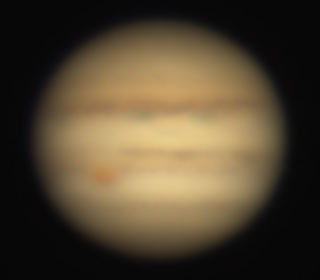 When imaged, Jupiter was at a distance of 658 million km and presented an equatorial diameter of 44.8 arcesc. It shone at magnitude -2.5 at an altitude of only 17°. On the disk of the planet, the Great Red Spot is visible in the Southern Equatorial Belt and, close to the north pole, Ganymede and its shadow. 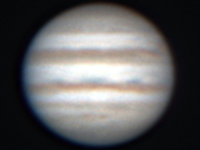 Meade 200 mm LX200 ACF with 2.5x Barlow and QHY5L-II camera. 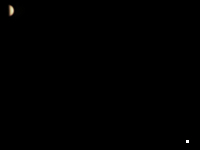 ZWO ADC in LH image. 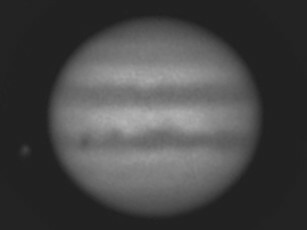 Processed using Sharpcap 3, Registax 6 and Photoshop CC 2018 (identical wavelet settings for both images). David Murton, 17 June 2017. 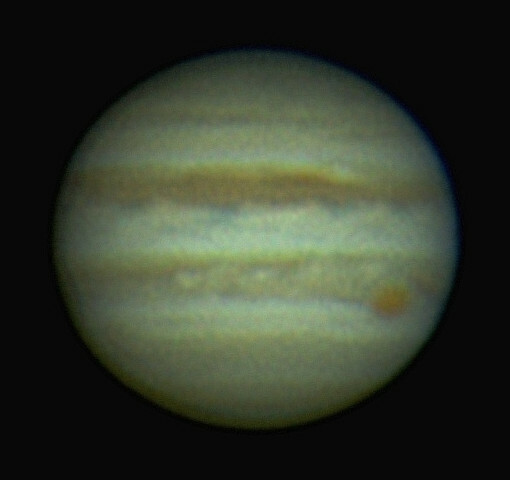 Image taken at 20:30 UT. 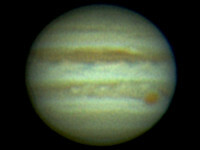 200 mm Meade SCT with Altair GPCAMv2 IMX224 camera and 2x Barlow lens. David Murton, 12 June 2017. 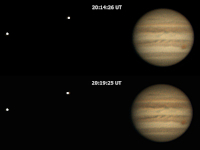 Jupiter, 20:06 - 22:06 UT, with Io, Europa, the shadow of Io and a transit of the Great Red Spot. 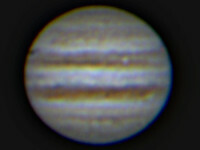 200 mm Meade SCT with Altair GPCAMv2 IMX224 camera and 2x Barlow lens. David Murton, 10 June 2017. 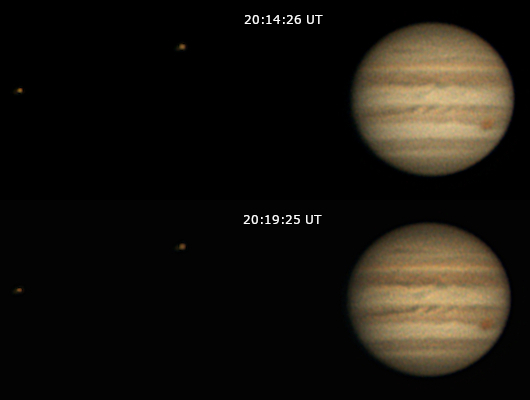 Top (L-R): Jupiter, Ganymede and Io at 20:14:26 UT. Bottom: the three bodies four minutes later. 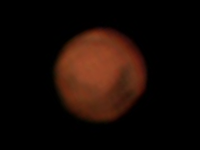 Taken with 200 mm Meade SCT with Altair GPCAMv2 IMX224 camera and 2x Barlow lens. David Murton, 20 May 2017. 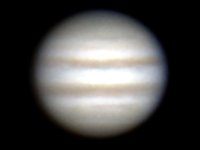 Jupiter at 20:15 UT. 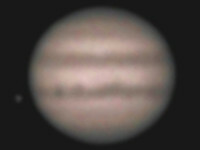 200 mm Meade SCT with Altair GPCAMv2 IMX224 camera and 2x Barlow lens. David Murton, 20 May 2017. Jupiter at 21:20 UT. 200 mm Meade SCT with Altair GPCAMv2 IMX224 camera and 2x Barlow lens. David Murton, 20 May 2017. 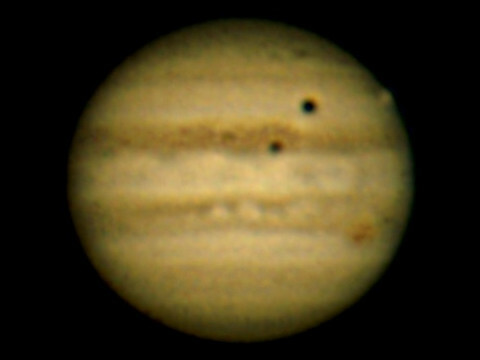 Jupiter with Io in shadow transit (ingress 22:22 UT, egress 00:32 UT). Europa is to the east (visible in the full image, not the thumbnail. 200 mm Meade SCT with 2x Barlow and Altair GPCAMv2 IMX224 camera. Andy Gibbs, 13 May 2017. 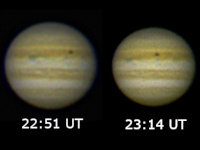 Three images of a shadow transit of Io, taken at 20.46, 22:01 and 21:19 UT. 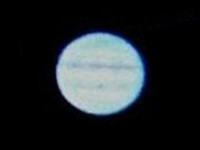 Jupiter was shining at mag -2.4, at altitude 33°, diameter 43", 693 million km from Earth. Meade 200 mm LX200 with 2.5x Barlow and QHY5L-II camera. Processed using Sharpcap 2.9, Registax 6 and Photoshop Elements 11. Andy Gibbs, 15 April 2017. 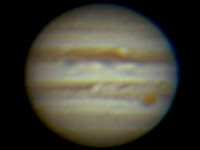 Image taken at 20.52 UT. 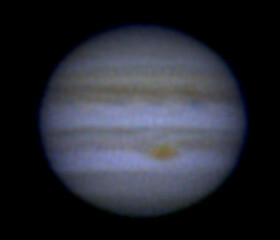 The Great Red Spot (GRS) was not visible, but there was plenty of activity on the disk and Oval BA may have been visible? 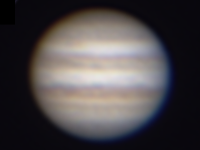 Jupiter was just past opposition (07 April 2017), shining at mag -2.5, at altitude 23°, diameter 44", 667 million km from Earth. Meade 200 mm LX200 with 2.5x Barlow and QHY5L-II camera. Processed using Sharpcap 2.9, Registax 6 and Photoshop Elements 11. David Murton, 15 April 2017. 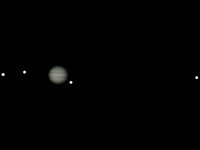 Jupiter plus the four Galilean satellites (visible in the full image, but not the thumbnail), L→R Europa, Callisto, Io and Ganymede. Skywatcher 190 mm Maksutov-Newtonian on NEQ6 mount. Altair GPCAMv2 IMX224 camera with 4x Powermate. David Murton, 13 April 2017. Motion of the Great Red Spot (GRS) demomnstrates the rotation of planet Jupiter. Skywatcher 190 mm Maksutov-Newtonian on NEQ6 mount. Altair GPCAMv2 IMX224 camera with 4x Powermate. Each image is formed from a stack of the best 5% of 1200 frames. Created using SharpCap, Registax and GIMP. David Murton, 31 March 2017. 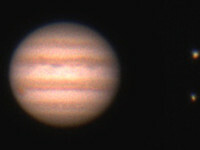 Jupiter plus, in order L→R, Europa, Ganymede and Io. Skywatcher 190 mm Maksutov-Newtonian on NEQ6 mount. Altair GPCAMv2 IMX224 camera with 4x Powermate. Andy Gibbs, 25 March 2017. 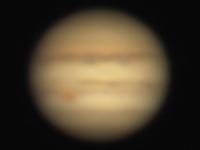 Jupiter was 44" in diameter, magnitude -2.4, 21° altitude, distance from Earth 670 million kms. Meade 200 mm LX200 with 2.5x Barlow and QHY5L-II camera. 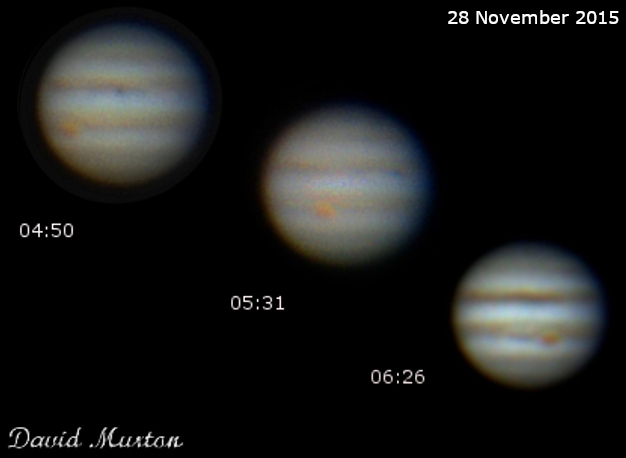 Images captured and processed in Sharpcap 2.9 and Registax 6. Observing conditions were near perfect: there was no interference from moonlight and no dew. David Murton, 16 March 2017. Skywatcher 190 mm Maksutov-Newtonian on NEQ6 mount. Altair GPCAMv2 IMX224 camera with 4x Powermate. David Murton, 29 December 2016. Skywatcher 200PDS 200 mm f/5 Newtonian on NEQ6 mount with 4x Powermate. Altair GPCAMv2 IMX224 camera. David Murton, 19 April 2016. Skywatcher 200PDS 200 mm f/5 Newtonian on NEQ6 mount with 4x Powermate. Altair GPCAMv2 IMX224. Taken at 21:07:58 UT. David Murton, 19 April 2016. Image captured immediately before preceding one, with same equipment. David Murton, 04 April 2016. Skywatcher 200PDS 200 mm f/5 Newtonian on NEQ6 mount with 4x Powermate. Altair GPCAM. Andy Gibbs, 25 March 2016. 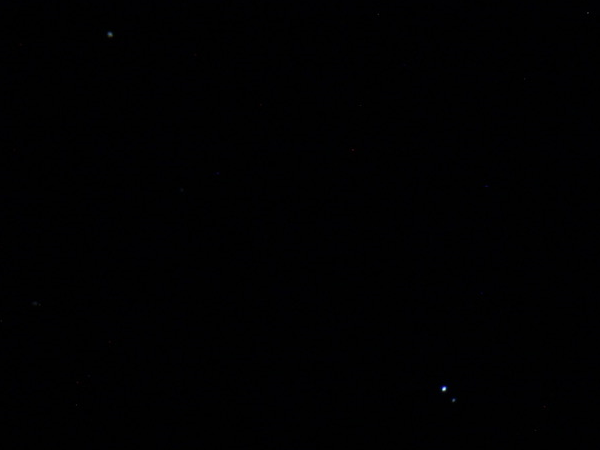 Jupiter with Europa, Io and Callisto grouped closely together to the west. 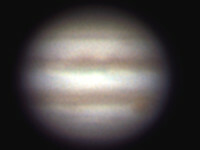 Jupiter was 44" in diameter, magnitude -2.45, 39° altitude, distance from Earth 670 million kms. Meade 200 mm LX200 with QHY5L-II camera. 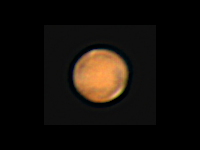 Images captured and processed in EZ Planetary, Autostakkert 2, Registax 6 and Photoshop Elements 11. High level cloud caused some difficulties. David Murton, 22 March 2016. 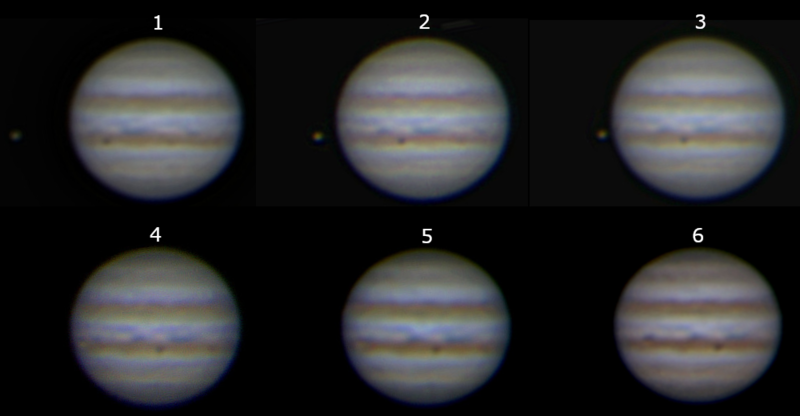 Excellent seeing conditions enabled detailed images of Jupiter to be captured with the GRS showing prominently. 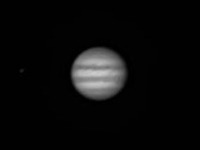 Tonight's images (only one shown here) are the best achieved so far. Taken at approximately 21:00 UT. Skywatcher 200PDS 200 mm f/5 Newtonian on NEQ6 mount with 4x Powermate. Altair GPCAM. SharpCap and Deep Sky Stacker. David Murton, 16 March 2016. 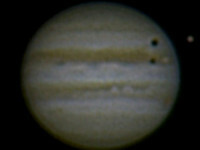 Double shadow transit of Jupiter by Ganymede and Io. Ganymede is on the limb; Io is already in transit. Note also the GRS. Skywatcher 200PDS 200 mm f/5 Newtonian on NEQ6 mount with 4x Powermate. Altair GPCAM. David Murton, 08 March 2016. 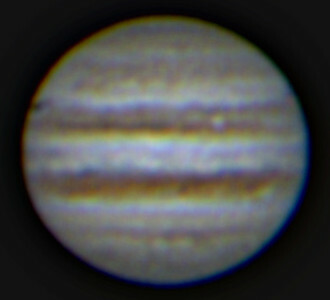 Jupiter during simultaneous transit of Europa and Io. 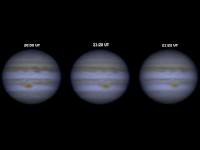 In frames 1-3, Io appears to the east of Jupiter with Europa already in transit; in images 4-6, both satellites are in transit. 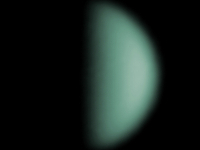 (Transit and shadow transit are virtually simultaneous, as the planet is close to occultation). Skywatcher 200PDS 200 mm f/5 Newtonian on NEQ6 mount with 4x Powermate. Altair GPCAM. Andy Gibbs, 07 March 2016. 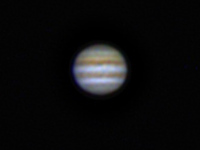 Jupiter, shining at magnitude -2.49, 33.4° altitude, 44.5" in diameter, with Europa to the east and Io further east. 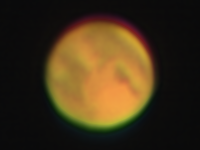 Image taken at 22:00 UT with Meade 200 mm LX200, Atik Titan camera and 2.5x Barlow lens. Image aligned and stacked in Autostakkert 2 then processed in Registax 6 and Photoshop Elements 11. David Murton, 04 March 2016. Skywatcher 200PDS 200 mm f/5 Newtonian on NEQ6 mount with 4x Powermate. Altair GPCAM. David Murton, 04 March 2016. 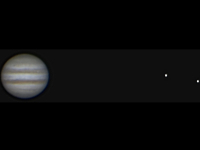 Jupiter, Io and Europa. Skywatcher 200PDS 200 mm f/5 Newtonian on NEQ6 mount with 4x Powermate. Altair GPCAM. Andy Gibbs, 25 February 2016. Meade 200 mm LX200 with QHY5L-II camera and 2.5x Barlow. Image processed in Photoshop Elements 11. Image taken at 20:50 UT, with Jupiter at altitude 21°. The planet is currently shining at magnitude -2.5, close to opposition on 08 March. David Murton, 19 February 2016. 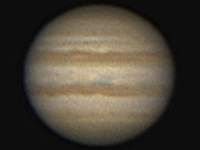 Jupiter at 05:08:36 UT. Europa is to the left with its shadow transiting the disk. Skywatcher 200PDS 200 mm f/5 Newtonian on NEQ6 mount with 4x Powermate. Altair GPCAM. David Murton, 19 February 2016. 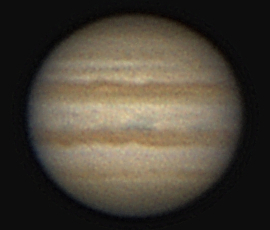 Jupiter at 05:15:24 UT. 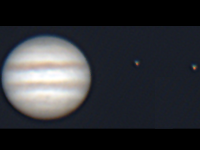 Europa is to the left with its shadow transiting the disk and Io is further to the left (visible in the full image but not the thumbnail). Equipment as previous image. Mike O'Mahony, 16 February 2016. Jupiter at 22:00 UT. 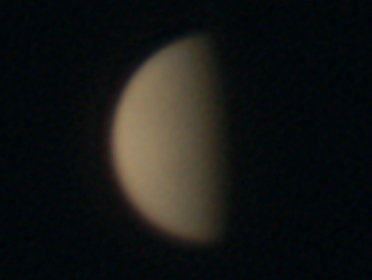 Taken with 235 mm f/10 SCT and Canon 60Da camera in movie crop mode. 150 frames stacked in Lynkeos with little subsequent processing. The GRS appears very red. David Murton, 03 February 2016. 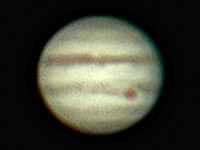 Io is to the left (in the full image but not the thumbnail below), Ganymede to the upper right and Europa to the lower right. Skywatcher 200PDS 200 mm f/5 Newtonian on NEQ6 mount with 4x Powermate. QHY5L-II camera.Image taken at 04:52 UT. David Murton, 17 December 2015. 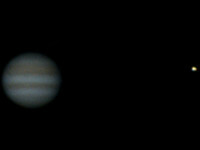 From left to right in the full image: Io, Europa, Jupiter, Callisto, Ganymede. Skywatcher 200PDS 200 mm f/5 Newtonian on NEQ6 mount with 4x Powermate. QHY5L-II camera. 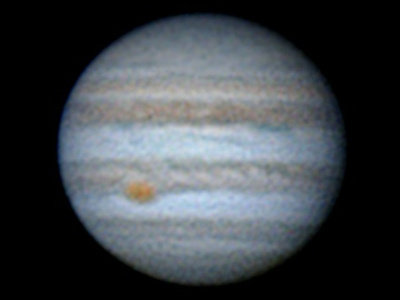 Image taken at 04:30 UT. David Murton, 09 December 2015. 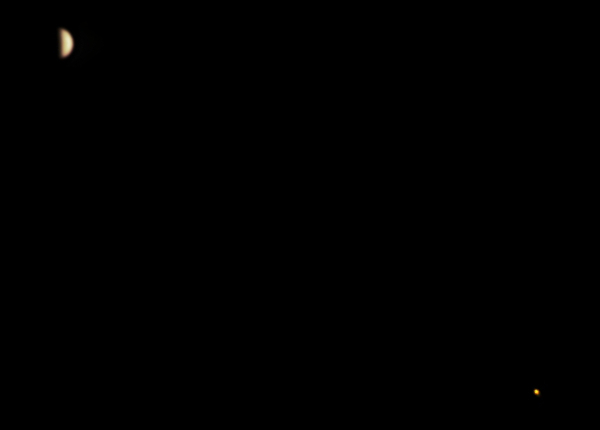 From left to right in the full image: Europa, Jupiter, Callisto, Io, Ganymede. Skywatcher 200PDS 200 mm f/5 Newtonian on NEQ6 mount with 4x Powermate. QHY5L-II camera. Image taken at 05:38 UT. David Murton, 28 November 2015. 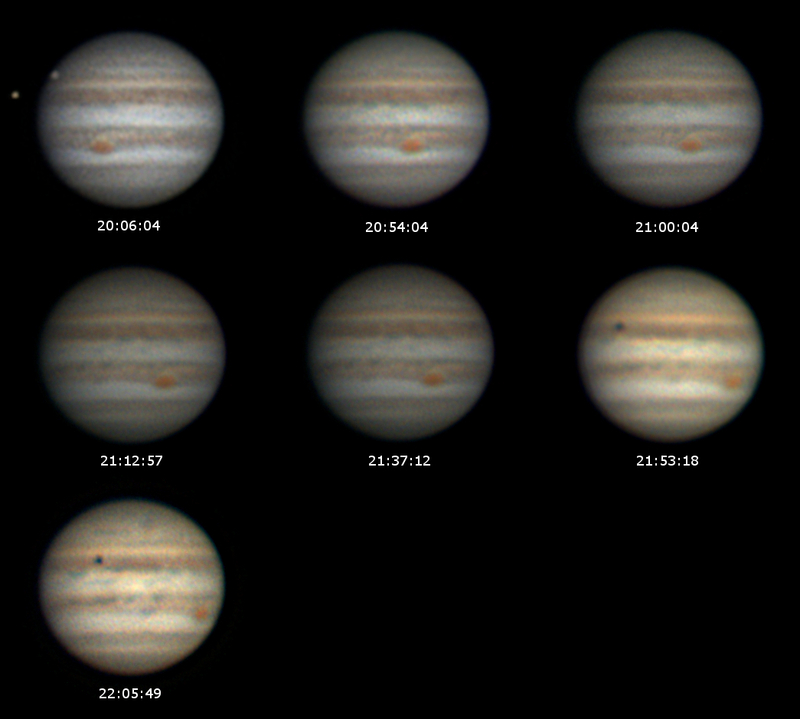 Montage of images showing rotation of the GRS rotation and a shadow transit of Io. Skywatcher 200PDS 200 mm f/5 Newtonian on NEQ6 mount with 4x Powermate. QHY5L-II camera. 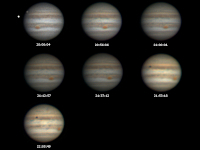 Images taken at 04:50, 05:31 and 06:26 UT. Kevin Fulcher, 13 November 2015. 200 mm Skywatcher 200P on HEQ5 mount with RA drive. 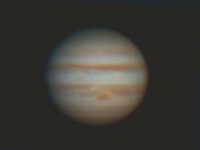 2x Barlow lens and guide camera. 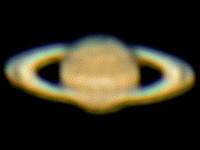 Image captured using Sharpcap then stacked using Registax. Andy Gibbs, 21 February 2015. Meade 200 mm LX200 with Atik Titan camera at 15 FPS. 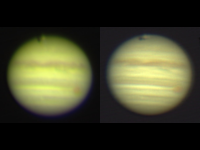 Image stacking with Autostakkert, wavelet processing in Registax 6 and final editing in Photoshop Elements 11. David Murton, 18 February 2015. Skywatcher 200PDS 200 mm f/5 Newtonian on HEQ5 mount with 4x PowerMate and QHY5L-II camera. David Murton, 17 February 2015. Skywatcher 200PDS 200 mm f/5 Newtonian on HEQ5 mount with 4x PowerMate and QHY5L-II camera. David Murton, 16 March 2014. Seeing was very good with the best eyepiece views that I can remember. 200 mm Dobsonian with 5x Barlow. Single shot 0.125 s exposure at ISO 200 with Canon 1100D. Chris Stevens, 11 March 2014. 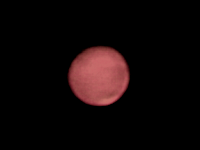 NexStar 130 SLT goto Newtonian (130 mm, f/5) with 5x Barlow (making focusing very difficult!) First use of a newly-acquired, pre-owned Phillips SPC900 wecam. 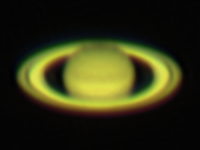 1000 frame AVI at 10 FPS, captured using SharpCap2, then stacked using AS!2 (produced better results than Registax). The final stack used the best 700 or so frames. Image then post processed in Photoshop CS6 for curves, levels, colour balance, noise, sharpening etc. Andy Gibbs, 16 February 2014. 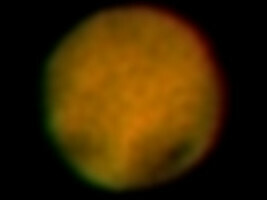 Meade 200 mm LX200 with 2.5x Barlow, giving f/25. First use of a newly-acquired QHY5L-II camera. 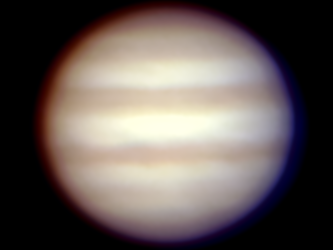 Imaged Jupiter at approximately 100 FPS at 800x600 resolution. (The EZ Planetary software was temperamental as the camera drivers seemed fussy with USB3.) Seeing conditions were not good and the optics became dewed. Image processed in iPhoto to de-noise and add sharpness. Matthew Leeks, 11 January 2014. DSLR with Tomline Refractor at Orwell Park Observatory. James Appleton, 05 November 2000. 250 mm Meade SCT used in eyepiece projection mode (26 mm eyepiece) with a Starlight Express MX916 camera. 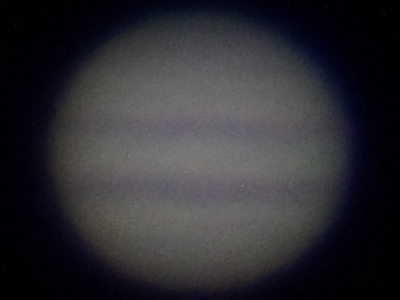 Exposure 0.01 s. The Great Red Spot is very prominent. Nick Sullivan, 01 November 2000. Digital camera at eyepiece of 250 mm Dobsonian using a Meade 6.7 mm ultra-wide angle Plossl eyepiece and blue filter. 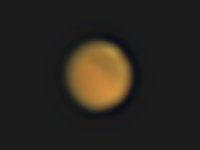 The shadow of Io is visible just below Jupiter's equator. David Murton, 30 July 2017. Saturn at 21:24 UT. 200 mm Meade SCT with Altair GPCAMv2 IMX224 camera and 2x Barlow lens. 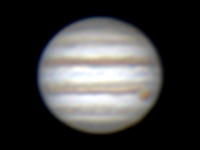 Best 120 frames selected from 1200, stacked with Registax 6 and processed with Gimp. Andy Gibbs, 03 July 2017. Meade 200 mm LX200 with QHY5L-II camera and 2.5x Barlow. Image processed using Sharpcap 2.9, Registax 6 and Photoshop Elements 11. 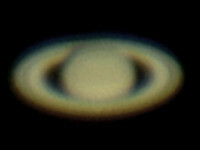 Image taken at 21:43 UT, with Saturn at magnitude +0.1. David Murton, 02 July 2017. 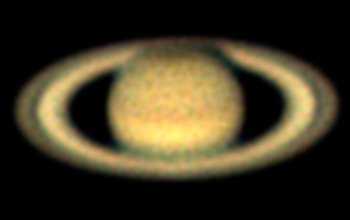 Saturn at 21:24 UT. 200 mm Meade SCT with Altair GPCAMv2 IMX224 camera and 2x Barlow lens. Best 300 frames selected from 1200, stacked with Registax 6 and processed with Gimp. David Murton, 17 June 2017. 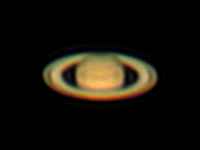 Saturn at 22:28 UT. 200 mm Meade SCT with Altair GPCAMv2 IMX224 camera and 2x Barlow lens. David Murton, 10 June 2017. 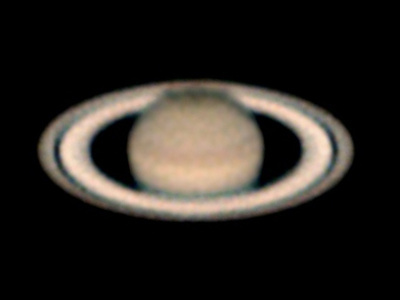 Saturn at 23:06 UT. 200 mm Meade SCT with Altair GPCAMv2 IMX224 camera and 2x Barlow lens. David Murton, 05 July 2016. Image taken with Saturn at low altitude. Skywatcher 200PDS 200 mm f/5 Newtonian on NEQ6 mount with 4x Powermate. Altair GPCAM v2 IMX224 camera. David Murton, 05 July 2016. 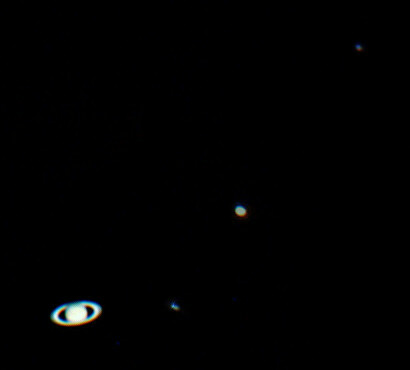 Saturn and its moons Rhea, Titan and Iapetus (L-R). Skywatcher 200PDS 200 mm f/5 Newtonian on NEQ6 mount with 4x Powermate. Altair GPCAM v2 IMX224 camera. David Murton, 09 June 2016. 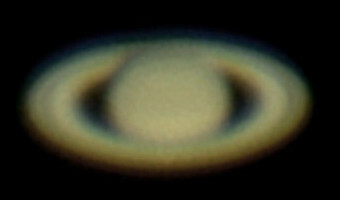 Image taken with Saturn at low altitude. Skywatcher 200PDS 200 mm f/5 Newtonian on NEQ6 mount with 4x Powermate. Altair GPCAM v2 IMX224 camera. Andy Gibbs, 05 June 2016. Meade 200 mm LX200 with 2.5x Barlow lens and QHY5L-II camera. Firecapture v2.3, Registax 6 and Photoshop Elements 11. The planet was shining at magnitude 0.0 and presented a disc of diameter 18.4". David Murton, 28 May 2016. Image taken at 01:23:48 UT, with the planet in the atmospheric murk near the horizon. Skywatcher 200PDS 200 mm f/5 Newtonian on NEQ6 mount with 4x Powermate. Altair GPCAM v2 IMX224 camera. David Murton, 28 May 2016. 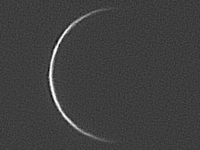 Image taken at 01:11:07 UT, a few minutes before the preceding image, with the same equipment. David Murton, 20 April 2016. 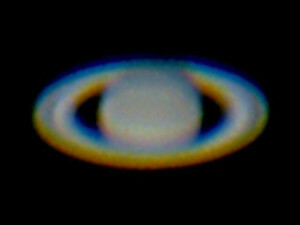 Saturn at 03:00 UT. Skywatcher 200PDS 200 mm f/5 Newtonian on NEQ6 mount with 4x Powermate. Altair GPCAM v2 IMX224 camera. David Murton, 20 April 2016. Equipment as previous image. David Murton, 23 March 2016. 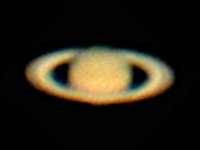 Saturn is still at relatively low altitude but getting better. Skywatcher 200PDS 200 mm f/5 Newtonian on NEQ6 mount with 4x Powermate. Altair GPCAM camera. SharpCap 2.7 and Deep Sky Stacker used to stack best 68 frames from 400. David Murton, 19 February 2016. 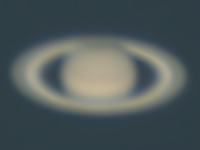 Saturn at 06:17:50 UT. The planet was at low altitude in the atmospheric murk so little detail is visible. Skywatcher 200PDS 200 mm f/5 Newtonian on NEQ6 mount with 4x Powermate. Altair GPCAM camera. David Murton, 19 February 2016. Saturn at 06:15:30 UT. Same equipment as preceding image. David Murton, 19 February 2016. 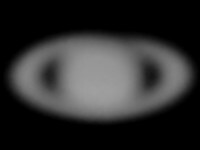 Saturn at 06:07:31 UT. Same equipment as perceding image. David Murton, 15 June 2015. Skywatcher 200PDS 200 mm f/5 Newtonian on HEQ5 mount with 4x PowerMate and QHY5L-II colour camera. Little detail is evident on the surface of the planet as it was at low altitude. Mike O'Mahony, 04 June 2015. 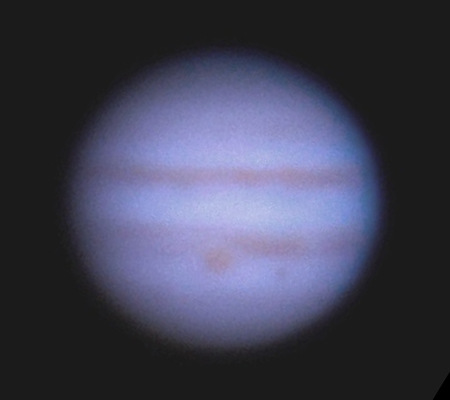 Meade 235 mm SCT and Canon EOS 600D camera. Movie taken at 50 frames/sec; ISO 2000, 500 frames stacked in Lynkeos (Mac). The planet was at altitude 18°, shining at magnitude +0.1. Mike O'Mahony, 26 April 2014. 300 mm Dobsonian with 5x PowerMate and Canon EOS 600D camera. Stack of twenty 1/50 s exposures at ISO 3200. 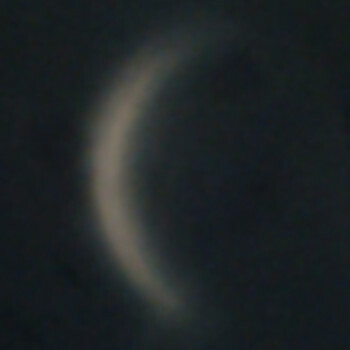 Image compromised by low altitude (only 15°) and high level cloud. Mike O'Mahony, 07 May 2013. 120 mm f/7.5 refractor with 5x PowerMate and Canon EOS 600D camera. 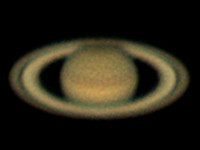 Ten 1 s exposures at ISO 200 stacked with Registax. James Appleton, 05 November 2000. 250 mm Meade SCT used in eyepiece projection mode (26 mm eyepiece) with a Starlight Express MX916 camera. Exposure 0.01 s.
Nick Sullivan, 19 October 2000. 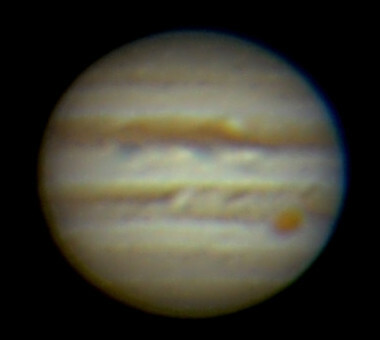 Digital camera at eyepiece of Celestron Ultima 8 PEC using a 6.7 mm ultra-wide angle Plossl eyepiece. 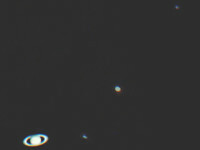 Telescope unguided. David Murton, 07 September 2016. Skywatcher 200PDS 200 mm f/5 Newtonian on NEQ6 mount with 4x Powermate. Altair GPCAMv2 IMX224 camera. David Murton, 25 November 2015. Skywatcher 200PDS 200 mm f/5 Newtonian on NEQ6 mount with 4x Powermate. QHY5L-II camera. Equipment accurately aligned on more than 20 stars. 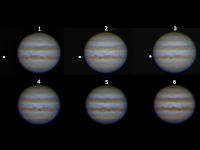 Best 20 frames stacked and processed in Registax from 200. Mike O'Mahony, 13 November 2014. Meade 235 mm f/10 SCT and webcam, 200 frames stacked. 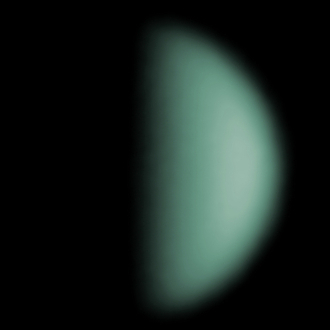 Uranus is currently at magnitude +5.7 and at high altitude in late evening (42° at 22:00 UT) and exhibits a distinctly blue colour. Although the image size is very small, I estimated the apparent diameter of the planet as 4" which, given its physical diameter of 51,118 km, puts it at a distance of 2700 million km from Earth. Mike O'Mahony, 29 November 2017. Meade 235 mm SCT with 2.5x Powermate (effective focal ratio f25) and Canon 60 Da camera. Exposure 6 s at ISO 1500. At a distance of 4.5 million km, Neptune orbits at the edge of the solar system. Tonight it looked very beautiful. Mike O'Mahony, 22 September 2017. 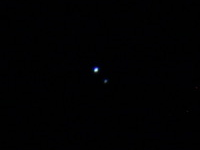 Neptune and Triton, the two objects at a separation of approx 17 arcsec.  Triton is at magnitude 13.6. To the top left of the full image (not visible in the thumbnail) is the star GSC 5813-0161 at magnitude 14.1. Taken at 20:38 UT. 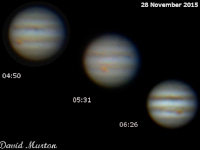 Meade 235 mm f/10 SCT and Canon 60Da, ISO 1000, single exposure of 5 s.
Mike O'Mahony, 05 September 2014. 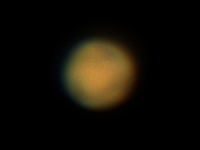 Meade 235 mm f/10 SCT. Neptune was at opposition at the end of August, at magnitude +7.8, at a distance of approximately 4.3 billion km. Its surface temperature is approximately -200°C. The image is stacked from frames of a movie. 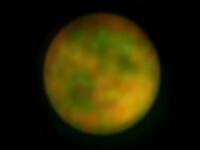 The planet appears approximately 8 pixels wide, equivalent to an angular diameter of 3.1", compared with the "official" value of 2.4". 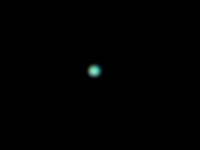 Neptune was low in the sky (about 22° altitude) and it was windy (as always in Felixstowe!) so the image quality is poor, explaining the inaccurate measurement. Visually the colour was probably a brighter blue than the image suggests although I had to slightly adjust the colours to compensate for atmospheric refraction.